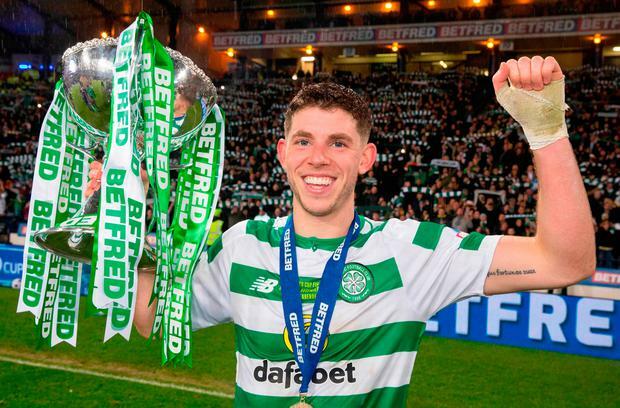 Celtic's Ryan Christie lifts the cup during the Betfred Cup Final match at Hampden Park, Glasgow. Sunday December 2, 2018. Jeff Holmes/PA Wire. Christie collected the Ladbrokes Premiership player of the month award after taking his recent tally to six in nine Celtic matches when scoring the opener in Wednesday's 1-1 draw at Motherwell. He scored a spectacular goal and had a hand in both the other goals against Hearts and has never looked back since - starting twice for Scotland and netting the cup-final winner against the Dons. But the new-found adulation will not go to Christie's head as he sets about continuing his run of goals and assists. "It's my job as an attacking midfielder," he said. "The manager wants goals from all areas of the park and even from midfield at this club you need to carry a goal threat. "I'm happy that I'm doing that just now and long may it continue. "The boys I am playing with, it's easy to feed the ball to them and let them score too. Another example of how quickly football can change is the form of Celtic's opponents on Saturday, Kilmarnock.